I do admit that I'm no expert on coach operators. 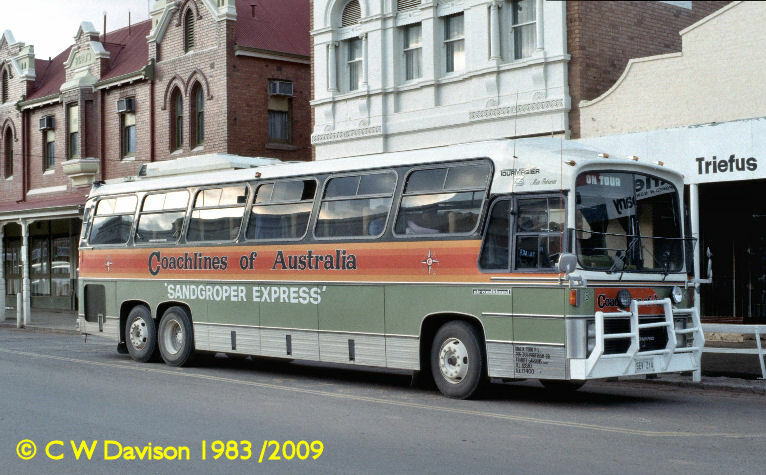 That said, my long standing understanding is that the original Sandgroper Express was affiliated with / operated by Tourwest, initially based in Rivervale, and later Belmont, WA, and Dial-A-Tour, Adelaide, SA - I think they traded as Coachlines of Australia, or maybe that was just Dial-A-Tour? As I recall, at some stage, the combined operation was rebadged as Across Australia Coachlines (AAC). Some time later, AAC in combination with Quest Tours of Adelaide, SA, became the nucleus for Bus Australia, in which Max Winkless (WA Volvo bus & truck dealer) had a substantial interest. Plus, there was Olympic East West operating across the big paddock (Nullarbor) 5 or 8 times a fortnight in the early 1980s - didn't that firm play some part in the birth of Deluxe ? There was an article about Deluxe in Australian Bus Panorama (I think) some time ago - wish I had paid more attention to what I read, or could find the article now. Of course, Bus Australia, Deluxe and Greyhound were 3 separate and rival entities in the mid and late 1980s .. .. But, not being an expert, I'm always open to correction by those board members who possess greater and more accurate knowledge of the subject. So I'll shut up now, except to say I have a pic of Dial-A-Tour 8 [SEV214] Austral Tourmaster taken in Kalgoorlie in 1983, which I can try to post if you think it relevant. Last edited by panther998 on Sat Dec 26, 2009 12:23 pm, edited 1 time in total. I know "Dial a Bus"/Coachlines of Australia in Adelaide.Their depot on Portrush Road,Trinity Gardens did run a service to Perth.They used their own coach/coaches.I dont know how many coaches were used on it. All coaches would be painted in the familiar red,white and blue livery.Parent company was called "The Bus Company". All charter/school buses were sold from December 1985 by "BusCoach PTY,LTD..I was working there at the time.Imported Bova's replaced locally made Domino's,Denning's,Volgren Twin Decks,Ansair Mercedes,etc.Max had seen them whilst in the Netherlands. Last edited by Denv12 on Tue Jan 28, 2014 5:47 pm, edited 1 time in total. Wouldn't have liked to have seen what hit that bullbar!! mrobsessed wrote: Wouldn't have liked to have seen what hit that bullbar!! It must have been strong to do that damage. To Clear things up, the original Sandgroper Express used to run one service a week between Perth & Sydney and the vehicle was a Volvo B10M single axle. It had to be towed into Adelaide after a breakdown. It was towed into Coachlines of Australia on Portrush Rd and a subcontract vehicle supplied to complete the service. Coachlines of Australia then purchased the Sandgroper Express and upgraded the service to three services a week, Coach 8 in the photo was indeed a tourmaster three with a Detroit 6/92tta but not with traditional Spicer but an Alison auto, the other two vehicles purchased for the service were Volvo b10m's with dual axles , 45 seaters with W/C and bunk and 12 speed ZF boxes. They were fleet number 4 & 20. Deluxe Coaclines at that time were a small company based in Wangaratta Vic and also started with one service that parelleled Sandgroper, Deluxe was i believe a company formed from ex employees of Continental Trailways also from Wang, Original drivers Reece,John Lane, Bob Hoffman. In years to follow Deluxe had a much greater financial backing and eventually purchased the licence and run from Sandgroper Express, The Sandgroper vehicles were returned to the ever expanding Coachlines of Australia charter fleet. Bob Jones eventually sold Coachlines of Aust and past away a few short years later at a very young age. Here is a copy of their timetable. I think PMC bodied. Their house was in Amherst Ave.They walked from their house through the back yard to the depot. What year did the company originally start and where was their first depot? Was there not a Dial A Tour on the Central Coast , was there some association with the one mentioned in this thread. Deluxe was not part of Continental Trailways, Deluxe was started by Len Rodens travel agency in Sydney using an old RFW coach, and Chartered vehicles from Hoys of wangaratta. As they grew they bought there own coaches. Continental Coachlines was set up by Ansett Pioneer to compete against the cheap low cost operators,When Hoys split from Deluxe the took over the operation of Continental Coachways with the Ansett RFWs, this was only short lived and Hoys dropped it and started doing MELb- Syd - Bris as Hoys Intercapital, this last for a Few years before it was shut and passengers transferred to Deluxe. To operate the service they used coaches from Hoys Wangarrata and Brian Hoy. I hope this is correct as it is along time ago and memory is starting to Disapear. That single axle Domino Volvo made its way into the Quest Tours fleet in its Across Australia Coachlines livery,along with the Howard Porter Volvo too.The Howard Porter got used on express during 1985/1986 as a back up.I drove it from Adelaide to Coolgardie once.Nice coach. It sat in an auction yard on Main North Road Mawson Lakes later still in its AAC livery. The Domino Volvo was sold to St Agnes Tours then on to Flynn's Buslines.It was involved in an accident out at Smithfield SA where it was damaged beyond repair late 80s or early 1990s.Both Volvos and a PMC bodied Volvo 3 axle were used on express in a brown livery before Max Winkless bought AAC,Parlorcars and Quest Tours in 1985. I remember hearing years ago from people in Perth that Flight Centre had something to do with the start of the original Across Australia Coachlines.That Domino Metroliner did end up as a Quest Tours coach (Adelaide) doing mainly local charter after Max Winkless took over AAC,Parlorcars and Quest Tours in 1985. From there the coach went to ST Agnes Tours then onto Flynns Buslines. Dial A Bus in Adelaide had coaches on the Sandgroper Express.